Endings are hard to do. I have an English professor who asserted once in class that ‘most endings are bad… pretty much, all endings are terrible.’ In a way, he’s right. Story endings are artificial. They’re where we choose to stop telling a tale that, in the context of the real, continuing world, has no actual end. The editorial act of forcing an end to a story’s living world can be an easy thing to mess up: many people would put this kind of blame on Harry Potter. The best ending of any kind that I can think of is possibly the ending to Casablanca, followed quickly after by the ending to Watership Down, which actually made me cry when I was in fourth grade. I can’t think of many games that have a similar sense of profound resolution. Indigo Prophecy’s ending arguably ruined the game for me; the ending to Beyond Good and Evil is a bit too baffling to be fully satisfying. Many people detest BioShock’s ending. The ending to KOTOR II was an uninspired mess. There are games out there with spectacular finales, but I’d argue that they’re the exception to the rule: Modern Warfare is one. Portal is another. * Usually, after the player has spent his or herself on a traumatically difficult boss battle, where can a game go? Can tying up the loose ends of a possibly feather-light plot compete with the excitement of climactic play? Often, no. Games have it tougher than most media when it comes to endings. Well. IT HAS THE WORST CONTROLS OF ANY GAME, EVER. The final ‘boss fight’ of Machinarium is so unpleasant that I put the game down for a whole month. Though the rest of the game is a rather calm, contemplative thing, something that can be solved easily with an old and fuzzy laptop touchpad, the final ‘puzzle’ requires a mouse and infinite patience. You must play an extremely long and badly-designed Flash game for which no rules or objectives are given. Dying pulls you out into the world again, where you must repeat a few trivial adventure-game actions in order to reenter the fight. I died countless times, mainly because my screen was wider than the game file itself (Machinarium is Flash) and every time my cursor left the game panel, I would lose control of the character and die. Furthermore, it’s a mouse-aim game with no separate controls for your avatar: you trail around after the aim cursor, able to control your own position only indirectly. I’m sure that not everyone had as huge of a problem with it as I did; nevertheless, it’s so badly designed that I doubt it would do well as stand-alone gameplay. Which is important in a game that’s partially about games. It’s not the main theme, but it’s prominent, and I expected better. One of my favorite puzzles. It’s got the best background music. Furthermore, I feel that it pollutes the atmosphere of the entire game: it features your robot taking down enemies with a gun. Up until this point, Machinarium is about a relatively-pacifist underdog robot who is eternally harassed by aggressive, bombastic, armed criminals. I did not expect his final triumph to involve shooting people, even digital people. Aside from this, I enjoyed Machinarium immensely. It’s a gorgeous adventure game with awesome puzzles—something I hope to write about soon. I’m pretty sure that, art, difficulty, and puzzle-wise, it’s the best adventure game produced by anyone, ever, in several years. But I haven’t yet played Time Gentlemen, Please, so don’t hold me to that assessment. * Though the ending has apparently changed due to that awesome ARG— something I need to take a look at! I’d like to take this opportunity to talk about the ending of my favorite video game of all time — Morrowind. The entire game (with the exception of Tribunal) was extremely well-written, including the ending. Yet it was a bit…unsatisfying. “There are more monsters out in the land; more people to protect, more to do.” While that’s a perfectly acceptable and even laudable thing to do in a game that arguably reinvented the open world sandbox genre of RPGs, I can’t help but feel a little bit dissatisfied about it. Maybe they could have opened up a new area, or something. Don’t provide any more main plot, because that would be lame. Just some new places to go and check out, with about as much story as the rest of the non-main-plot of the game had (which was still substantial). Tribunal and Bloodmoon don’t really count because you could always visit them — you could just put off the main quest and go play their quests instead. So it would be a fitting ending for the game, I think, to have some new area to go check out and, unlike the otherwise amazing Bloodmoon, just have sidequests. Then you could finish the game doing what you did for the entire game anyway — running around doing sidequests and exploring until you get bored. That turned out to be a lot more rambley and incoherent than I thought it was going to be. Damn. I hadn’t thought about endings in sandbox/semisandbox games! But you’re absolutely right. I remember being SO EXCITED by the new post-Elite-Four content in Pokemon FireRed/LeafGreen because it gave context to the idea of continuing play. Before that, playing on simply to get level 100s all over the place seemed pointless to me. I didn’t expect to enjoy catching ‘em all if I had to catch-’em-all in such a deadened world. Games like this, that pad the experience by expecting you to sandbox without context, often don’t work out. They’re often games with a strong narrative, like Morrowind or Pokemon. After you beat the main conflict, sticking around in the gameworld with no further objectives and no further narrative feels hollow, or at least anticlimactic. Unimpressive, anyway. Maybe the new compulsion developers feel to keep us updated with INFINITE PLOTTY DLC a la Mass Effect 2 and Dragon Age will do something about this? But I don’t know– they’d be the kind of thing you disliked about Morrowind’s add-ons. Just something to do instead of the plot. Or maybe we just need to get used to a new kind of ending. I’m uncomfortable with a lot of game endings because they don’t match up to book endings. But in an experience that’s meant to be continued, I can’t expect to have that kind of ending, can I? 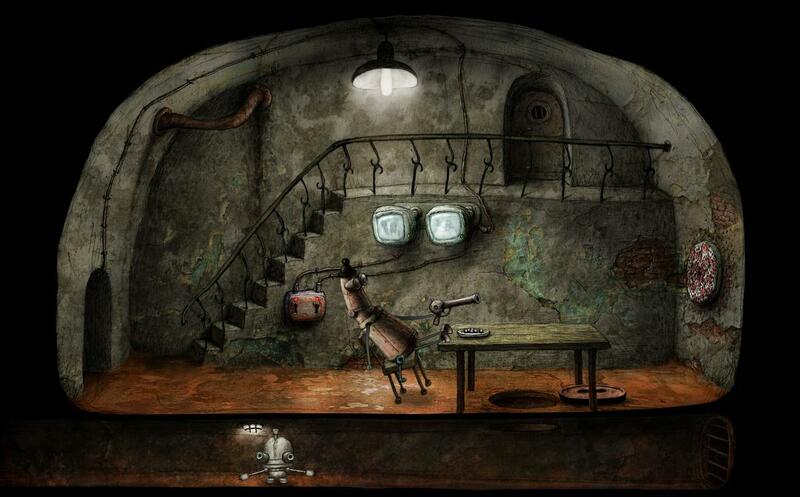 I really like the “game in the brain” part of Machinarium. I think the music is awesome, one of my favorite of the whole soundtrack. https://www.youtube.com/watch?v=QHWeOxdIDBo And the gameplay is fun. I had to play it a couple of times. Didn’t have trouble with the controls. 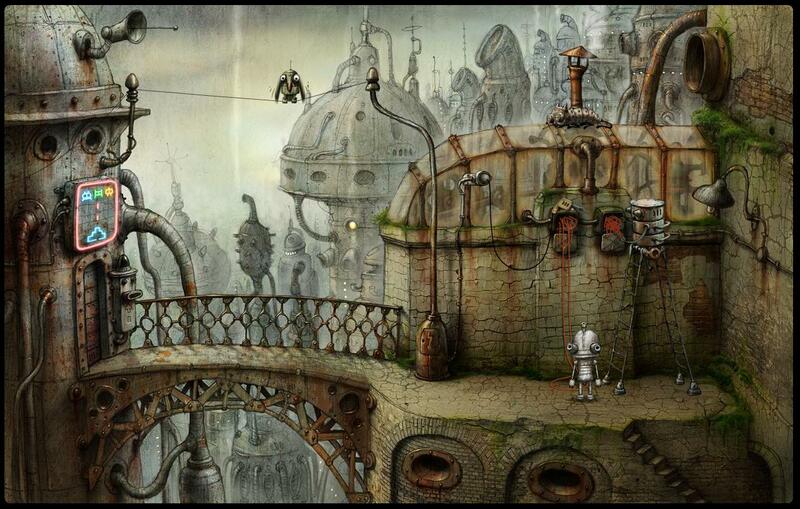 It is the only part of Machinarium that needs arcade / action game skills. Maybe you would have enjoyed it more if it wasn’t buggy on your computer.